On the weekend of the 23rd and 24th of April, Zero Waste Europe held its Annual General Meeting (AGM) with the participation of most of the members of the ZWE network. Held in Ljubljana, Slovenia, the first ‘Zero Waste European Capital’ and the European Green Capital for 2016, the event was co-hosted by Ekologi Brez Meja, the Slovenian member organisation of Zero Waste Europe. The meeting opened with introductions from the various member organisation of Zero Waste Europe in attendance. The attendees had produced short ‘posters’ giving an overview of the work that their organisations had been doing. This was followed by presentations from Joan Marc Simon, Director of Zero Waste Europe, on the activities and the financial position of the organisation. Then, the Zero Waste Europe staff gave an overview of their work areas and the upcoming events planned for the year ahead. The next sessions set out to discuss the upcoming events and work areas for the Zero Waste Europe network with the members breaking off into 3 groups. The groups were split into the themes of ‘Products, Good Design, and Plastics’, ‘Climate, Energy, and Air Pollution’, and ‘Waste Policies and Best Practice’. 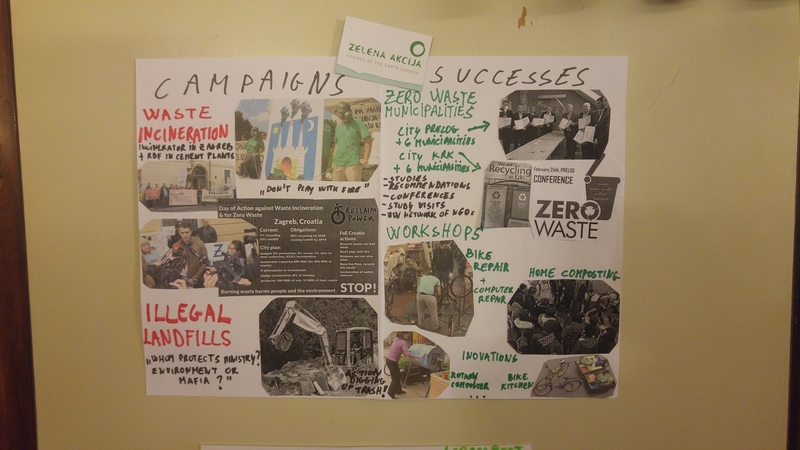 The result of these discussions was a clear timeline of events and activities planned by the members of Zero Waste Europe, and a vision of how they corresponded to the organisation’s work areas. The plans were then presented in a plenary session to all of the attendees of the AGM, thus closing the first day of the AGM. ‘Zero Waste Municipalities’. This discussion focussed on the regional and national differences in the use of the term, as well as national legislative implications for these variations. The current process was explained in detail and a number of different options for the future were discussed. Following the session on Zero Waste Municipalities, the applications from new members were approved. There were 6 new applications in total, from the Centre for Environmental Solutions (Belarus), the Ecological Recycling Society (Greece), the Association for Clean Environment, Let’s Do It Macedonia Macedonia, Friends of the Earth Croatia, Zero Waste Austria and Zero Waste Lithuania. After hearing introductions and having a question & answers session from the participants in attendance, the conference decided unanimously to grant full membership to the Associate for Clean Environment Let’s Do It Macedonia, the Center for Environmental Solutions, the Ecological Recycling Society, and Friends of the Earth Croatia, and to grant Aspirant membership to Zero Waste Austria and Zero Waste Lithuania, with the hope that in the future they will progress to becoming a full member. The penultimate session was the election of a new member to the Board of Zero Waste Europe. Flore Berlingen Director of Zero Waste France, stood for the position and after a brief deliberation was elected to the Board. The final session of the AGM was a discussion around Zero Waste Europe’s position on Bioenergy, in advance of the European Commission’s consultation on Bioenergy. This discussion tackled several key questions around the network’s position on different questions. The result of this discussion being the sign-on letter for the Bioenergy Consultation. The 2016 AGM brought together the majority of Zero Waste Europe’s members for two days of reflection and strategy discussion as well as the approval of future activities, new members, and the election of a new board member. Across the weekend, members shared inspirational stories and ideas, as well as developing a stronger connection between members, facilitating cross-european work over the coming year. The full minutes for the meeting will be distributed to members shortly.